For the former Township of Metcalfe in Middlesex County, Ontario, see Adelaide–Metcalfe. 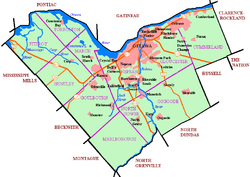 Metcalfe is a population centre located in Osgoode Ward, in the rural south-end of the city of Ottawa, Ontario, Canada. Prior to amalgamation in 2001, the community was in Osgoode Township. According to the Canada 2011 Census it has a population of 1,763. Colonel Archibald Macdonell, believed by some to be the first settler in Osgoode Township, settled just south of the current location of Metcalfe in March 1827. The village was originally called Hawley’s Corners, but in 1877 it was renamed to Metcalfe in honour of Charles Theophilus Metcalfe, Governor General of Canada from 1843 to 1846. Osgoode Township High School - The only high school in the township of Osgoode. The village is home to various sports facilities, most notably the Metcalfe Community Centre which bears the name of former Montreal Canadiens all-star defenceman Larry Robinson. The Centre's arena houses the local Junior B hockey team: the Metcalfe Jets. Notable Jets alumni include Larry Robinson and two of his brothers, as well as Boston Bruins' Marc Savard. It also hosts the Metcalfe skating club for figure skating and canskate. ^ "Monster runs amok in Metcalfe". Ottawa Citizen. 15 November 2008. Retrieved 6 September 2014.